If you are currently pregnant and thinking of booking a newborn photographer to photograph your new addition, this blog post is for you! Newborn photography is a relatively new thing, one of ‘those’ trends that came over from America and at first we are all like ???? about them. However, it is gathering momentum in the UK so I thought I would tell you all about it. I have been a Newborn photographer since 2010, this is when it was really just coming over, and my love of children and cameras merged. At first I ran my business either from my lounge, or from clients homes, both very stressful, especially with a baby that was sometime just days old. When I opened my studio in 2012 it was a breath of fresh air, lots of space, place for mum and dad to kick back, relax and have a (still hot) cup of tea or coffee. It is a totally wonderful experience, for both me and the parents and I often get comments on how I managed to soothe their precious little darling when all they have done that morning is cry. There are many magical techniques, well I say that, the whole thing is about prevention rather than cure. All of the poses that professional newborn photographers use are poses that your little sweetheart would have taken up comfortably in the womb. They have little muscle tone so nothing to stop their limbs doing something I could never dream of doing now. It is a very delicate balance though, never a case of picking up a camera and taking some photos. Posed AND unposed newborn photography has its risks and I am all about baby safety. For this reason, I am going to steer you along in choosing your Newborn photographer. It is truly worth the time of getting out and going somewhere new to capture all of those sweet poses, those little twitchy smiles and tiny fingers and toes for the very first time, that change very soon after the two week birthday mark. There are some people who are amazing with newborns, however the most popular pose in my studio is delicately known as the bottom up pose, this pose is adorable and you can see all features including a tiny little bottom, however pose them wrong and you could cause problems with the spine, a baby should never look like their spine is being curved too far, it should not look unnatural, there are tricks we can do in camera and post processing, but a good experienced photographer will know that every child is different and to keep that child's movements in mind when posing, not all babies can do all poses. Along with experience comes experience. Experience of knowing that a baby may come along with colic, or have clicky hips or something that hasn’t quite been signed off by the hospital, there are lots of ways of getting around these issues, as there are lots of poses that can be done, enabling your photographer to make sure you child is safe and comfortable during their shoot. Newborn photography is all about prevention, setting the right setting, the sounds the noises, knowing what calms and settles a baby. This is huge, has the photographer you are talking too been trained? If the website doesn’t say, ask them, anyone who is proud of their industry and not trying to cut corners will happily tell you all about their journey into this field. This not only covers training, but health and safety in their work whether they are studio based or travel to your home, you should always known how hot you can have your room, which poses suit a child, how to settle them and when to say no! Another big thing, are they insured? Why would you risk it, insurance is relatively cheap these days and safety should absolutely be the top priority. No photographer should ever force your baby into positions which make them uncomfortable or put them in danger. No baby should ever be expected to support the weight of its own head or body, be suspended from a height or put in a basket or box which could potentially topple over. The baby should be relaxed and comfortable at all times, and 100% safe. Are they a member of any newborn specific photography associations such as BANPAS? The best newborn photographers are also likely to be members of professional industry associations like BANPAS (the Baby and Newborn Photography Association). Photographers who are members will proudly show logos of such organisations on their websites and talk about their passion for working in a baby safe manner.To become a member they will have needed to prove that they have professional insurance as a very minimum. Being a member will demonstrate that they are committed to following a code of professional conduct, set out by the organisation, which has the best interests of your baby in mind. Are they a newborn specialist or a “jack of all trades” photographer? You should get a sense of this from looking at the body of work demonstrated on a photographers website. Do they mainly focus on weddings but do the odd newborn to keep finances ticking over during the down season? Do they seem to mostly work with older children with little evidence of newborn work? Or are newborns front and centre of their business with their studio specifically geared towards accommodating newborn babies and their families? Personally I wouldn’t book a mechanic to fit my bathroom and to me photography is no different! The skills required to be a great newborn photographer vary vastly from those required to ace weddings. Just because someone can take great photos of animals or landscapes does not mean they have any of the skills required to safely and beautifully pose a brand new sleeping baby. PLEASE don’t be tempted to cut corners by taking on anyone who doesn’t do photography professionally, as their main job, or who offers incredibly cheap prices. Photography is an expensive business to run and newborn photographers in particular spend hundreds if not thousands each year on props alone (just ask my accountant!). I believe that you get what you pay for in this life. If someone proclaims to offer a newborn session including photos for as little as £50, alarm bells should start ringing in your head! Anyone running a full time business simply couldn’t survive on that even if shooting five newborns a week as once you factor in overheads, tax etc they would end up with next to nothing. Choose a professional photographer and someone who is a specialist in newborn photography. If someone is good at their job, and in demand, their prices will reflect that. Cut-price photographers are likely to offer a second-grade service. Would you want to settle for that? Will they be able to meet your expectations? You may have seen examples of newborn photos that you would love a photographer to create with your baby. Make sure you discuss this ahead of the shoot to make sure that your photographer is able to meet your expectations. Will your photographer be able to create that specific pose, or not? If you have seen a particular image on social media that you have your heart set on but your chosen photographer cannot recreate will you be left unhappy? Also ask about whether you need to buy and bring any of your own props, or whether this is included in the shoot. Most newborn photographers will have an extensive selection of props, blankets, hats, headbands etc and you should not have to bring any of your own along unless you want to. Are you also welcome to bring in your own props? You may have a family heirloom or sentimental item that you want included in your photos. Is your photographer happy to incorporate this into the photos? Similarly, if you would rather the photos did not make use of props, do say in advance. Most photographers will likely aim to create a number of different setups throughout the shoot so there will be plenty of images for you to choose from afterwards, but if you have a preference in regards to styling and colours, do make this known ahead of the session to make sure they will deliver what you. I consult with my clients prior to the day of their session to discuss their preferences with regards to colours, props etc to ensure I have everything on hand on the day and they are not left disappointed that a particular hat they loved cant be used as it is in the wash! Does your photographer have a good reputation and happy clients? It is potentially quite easy for parents to be fooled into thinking that all newborn photographers are created equal. Let me assure you, they are not! The newborn photography industry here in the UK is currently unregulated. That means that there is no specific qualification that a newborn photographer must obtain before they can start offering the service. So, in theory, even a novice photographer, with zero experience of handling babies, could potentially setup shop and market themselves as a newborn photographer! This is very worrying but, unfortunately, happens a lot. I’ve heard horror stories of things that have gone wrong in newborn sessions, when babies are put in the hands of inexperienced and untrained photographers. Without the right professional training, a photographer could put your baby at risk. So I urge you to be vigilant and only use a reputable, experienced and professionally trained photographer. If you don’t have a personal recommendation from someone you trust, do your own extensive research before you commit to a booking. Read their reviews on Facebook, google, net mums etc. And ask in social media groups for opinions form people who have used them in the past. Look for comments and feedback from recent customers and see how they interact online. Do they seem positive, passionate about what they do, and good with people? Contact them directly and ask questions. All this will give you some idea of the kind of person they are and give you an impression of how they conduct themselves and their business. You should feel confident that you are selecting someone who knows what they are doing, will handle your baby safely and produce the kinds of images you want. You also want to make sure you are booking someone you will feel comfortable with and be able to relax and enjoy the experience. What happens if something goes wrong?! As most of us knows babies are a law unto themselves and some days no matter what you do they just wont settle or sleep. Sometimes they have a growth spurt so want to spend all day feeding. Or they have an upset tummy so spend all day pooping! Perhaps colic is rearing its dreaded head? Will your photographer be understanding of this and be able to rearrange your session? Will there be a cost for this? These are all perfectly understandable circumstances when it comes to working with newborns and an experienced newborn specialist should never make you feel guilty if your baby is unable to “perform” on the day. There are also a number of reasons why mum and baby do not get home from hospital until later on. Again a newborn specialist will be completely understanding of this and should be able to offer reassurance of what can still be achieved. What about the boring details? Will the photographer come to your home or will you need to visit their photography studio? If the photographer works from a studio is the location convenient for you? Are you able to visit in advance for a look around? Will travelling there with a brand new baby be difficult? Similarly if the photographer comes to you how much space do you need to clear? Is there sufficient space in your lounge or will they need to set up in your bedroom? Do you want someone coming into your home days after giving birth when it probably isn’t as tidy and presentable as you like?! Will you have to provide them with snacks etc? Where is the studio based and what distance will you need to travel? Do you know the way and how long it will take to get there? Always factor in extra time to allow for traffic – it’s far better to arrive early rather than late. How easy is the studio to access (you’ll be carrying baby in a car seat or will have a pushchair, no doubt)? Is there space in the studio for your pushchair once you arrive? If it’s not the ground floor, is there a lift you can use? And inside, is it clean and organised? Is there comfy seating for parents and any other family members who are coming along? Are siblings welcome and, if so, are there any child-friendly facilities available? What baby changing and feeding facilities are there? This is a lot to take in and a huge amount of information! But hopefully it highlights to you the importance of doing your research when looking for a newborn photographer. In St. Albans alone there are now dozens of photographers popping up each month offering newborn photo shoots. 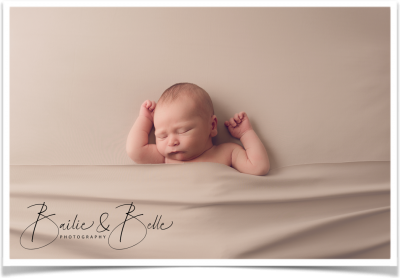 When I started Bailie & Belle there was only one other newborn specialist photographer! In the nearly eight years since Bailie & Belle was launched the newborn photography market has exploded which is great for everyone, I can’t possibly photograph all of the thousands of babies born in St. Albans each year, never mind those from surrounding areas! But it also makes choosing that bit trickier for parents to be so hopefully this has helped you to think about the factors that matter to you when choosing who to use to capture this milestone in your family history. Hopefully after considering all of the points made above you will feel confident in choosing a photographer whose style you love, who will deliver the quality of experience that you desire and that your new baby deserves, and photos that you will treasure for a lifetime. 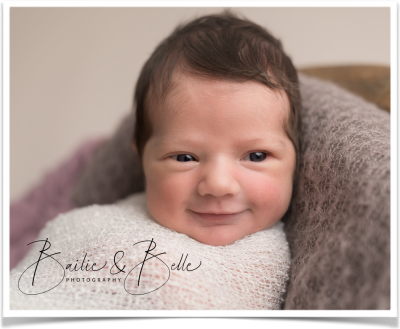 Should you wish to choose Bailie & Belle to photograph your newborn baby or just to discuss what to ask your potential newborn photographer, I look forward to hearing from you. Contact me at any time on 07527 172789, email me at [email protected] or complete the form on my contact page: www.bailieandbelle.com.